Arsenal’s summer signing, Lucas Torreira, is about to start his adventure at the Emirates stadium as noted from his recent social media activities. 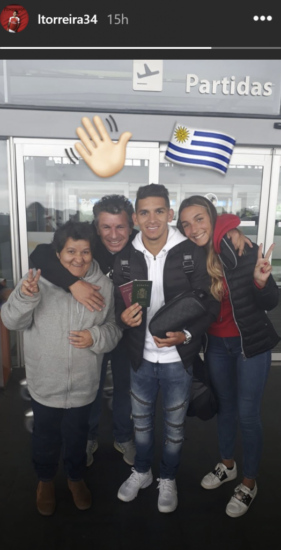 Torreira posted a picture of himself and his family at an airport in Montevideo as he waved goodbye to his Country.. signing. The Uruguayan has created a buzz among Arsenal fans who believe that their club have signed a true midfield stalwart since the exit of a certain Patrick Vieira some years ago. Torreira is known for his ball-winning abilities and passing range which would be vital in the midfield for the Gunners this season. Other first team players given extended break are expected to resume training today as the club increases preparation for the new season. Arsenal still have two matches remaining in pre-season against Lazio and Chelsea before kicking off the EPL against champions Manchester City. Arsenal fans will be hoping that Torreira becomes an instant hit at the club as Emery plots a title challenge this season.